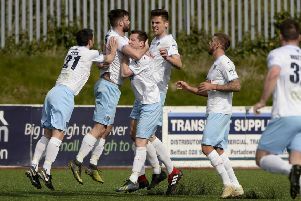 Details have been announced for Ballymena United’s end-of-season awards presentation. The annual function sees the season’s top performers rewarded and traditionally brings the curtain down on the playing season at the Showgrounds. This year’s players awards presentations from the club’s various Supporters Clubs and sponsors will be held after the last home game of the season v Dungannon Swifts in the Des Allen Suite. It will be a hot buffet priced at £7 per head and will be ticket only. Tickets will be available at this Saturday’s home game against Ballinamallard and on the day of the buffet. Among the awards which will be handed over will be the Player of the Year, Players’ Player of the Year and Leading Goalscorer, while awards will also be presented to the top performers at reserve and youth team level. “The bar will be open as normal and after the awards as well,” said a club spokesman. “We would welcome all supporters to the awards for the players and thank them for all their efforts this past season,” the spokesman added.